Friday morning started early with the rest of the team arriving from the airport. Following a quick breakfast provided by the event organizers the 3 team drivers attended the drivers meeting and track walk around. Here the details of the track were discussed and the different driving rules were explained. Following this were the opening ceremonies where the event was officially kicked off by the mayor of Houston and Shell Executives. 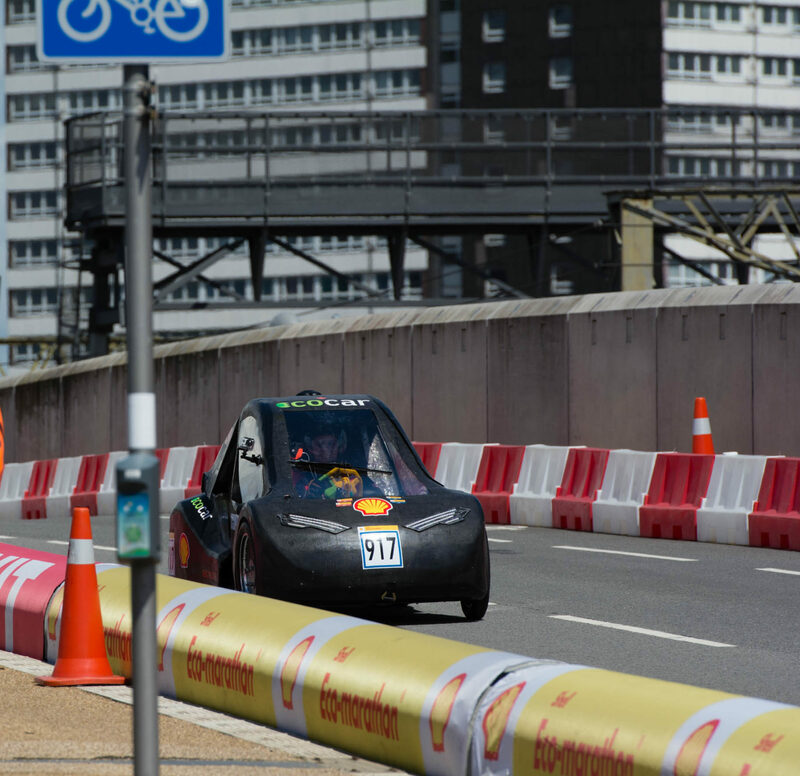 As there are two categories of vehicles at this event; urban concept and prototype, the race days were divided into slots when each category of vehicle would be able to compete. As there were more prototype vehicles than urban concept vehicles; there were 3 slots for prototype vehicles and 2 for urban concept a day. This would give us 2 opportunities a day to complete a successful run after we completed our technical inspection. Having taken apart the electronics of our vehicle for safe transportation down to Houston, the electrical team began assembling them back into the vehicle. All of the wiring had to be put back together and then the team had to go through all of the trouble shooting to ensure everything worked according to design. Also, due to the technical issues experienced by our vehicle body vendor in the days leading up to the competition we were not able to compete with the bio-fiber body we had designed. Instead, our team had spent the last week and a half building our plan B body. It was not an easy task to create a vehicle body in under two weeks that would meet all of the technical requirements for the race, however being so close to competition our team made a really big push to ensure we made it. There were several differences between this body and the original design and the mechanical team had to work to develop new ways of securing the body to the chassis. As things started to come together and the team prepared for the technical inspection it became apparent that there were still some minor details that would need to be addressed. These included wiring and connecting all of the vehicles lights, leak proofing all of the hydrogen fittings, attaching side view mirrors, attaching the rear compartment window, etc. Throughout the day, as the team worked on these tasks, it became apparent that we would not have a fully functioning vehicle ready before the technical inspection station closed down for the day. For this reason we chose to get as much done as possible and then take our car through the inspection just before they closed. This way we would be able to find out everything that we would need to work on overnight to ensure that the vehicle would be able to pass the inspection the next morning. It was important for our team to pass the inspection as soon as possible so that we would be able to take our vehicle on the practice track and could begin full testing of the vehicle. As we went through the technical inspection things were looking good. Our car weighed in at 136kg, which was well under the allowed 205kg. We easily passed the inclined brake test, as well as the dimension test. Our driver also passed the exiting the vehicle in under 10 seconds test, although it was very close with a time of 9.4 seconds. The only two things we had to change on our vehicle from a mechanical perspective were to move the tow hook on the bottom of the car further forward for earlier access and increase our ride height to meet the minimum ground clearance. On the electrical side things were also looking really good and the minor changes that were required were easy to complete that night. All in all it had been a very productive day and the team was feeling really good about having a vehicle ready to compete for Saturday. We had worked hard to ensure that everything would be ready for the morning test. Another interesting thing to mention from the day was that our truck battery had died overnight. This caused some commotion and stress in the morning. Following several attempts to boost the battery we had to resort to towing the truck to the nearest Ford dealership. At the dealership they found that the battery had been run so low that boosting it would not help. Luckily everything was still under warranty and they were able to provide us with a new battery.